When attempting to live frugally it is important not to do this from a mental place of lack – ‘I can’t have this’ or ‘can’t do that’ attitudes will not help you. Having lots of ‘things’ was never going to make you happy anyway – often people find that when they start living more simply they replace all the running about spending with happiness! Of course you can still have things – you just won’t pay so much for them! 2. Expect the best (can be difficult to keep up!!) – haven’t you noticed how people who are always pessimistic and moaning keep having bad experiences and lots of bad luck? There’s a reason – whatever you focus on most is what you attract to you – let it be good stuff! Let your mind dwell on the things you love. 3. Don’t let frugallity make you mean – you can be generous without being wasteful – what goes around comes around. 4. Be nice to yourself – you deserve it – give yourself little treats whether it’s a glass of wine, a bath with candles and essential oils or an hour in the sun with a book – it doesn’t have to be a mad shopping spree. In fact frequent over-spending is often the result of some deep emotional unhappiness – the spending won’t cure it. 5. Practices like meditation, walks in the country and yoga help to keep you centered and calm. 6. Don’t beat yourself up if you fall off the wagon – whether it’s with positive thinking or being frugal – forgive yourself and move on. 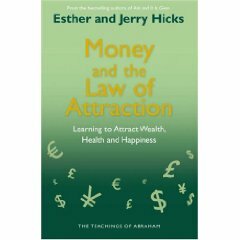 ‘Money and the Law of Attraction’ by Esther and Jerry Hicks is a fabulous work about the power of our thoughts – a very timely publication to keep us uplifted and positive, attracting what we want rather than what we don’t!! Buy from Amazon.co.uk or Buy from Amazon.com (USA) Also available on audio CD (the paperback book does have a short CD with it too) – great to have on in the background. Even if you’re feeling down, it’s amazing how this can improve things! Buy from Amazon.co.uk or Buy from Amazon.com (USA) You can read or listen to much of their material for free on their website and also sign up for daily inspirational emails. The Hay House YouTube channel has some wonderful, motivational and uplifting content. ‘The Secret’ by Rhonda Byrne. Well known film (and then book and CD should you wish reinforcement) about manifesting. Many inspirational writers and speakers are featured throughout. Many people have used the techniques to transform their lives. Our current house is a mixture of things weve always wished for, it’s kind of proof of the pudding for us as weve been studying similar books for a while now. We all enjoyed the film very much and keep the book in the bathroom for anyone to peruse. A fabulous live recording of Wayne Dyer and Byron Katie. We bought this for Wayne as weve long been familiar with the power of his recordings but were blown away (in a good way!) by Byron Katie’s work too. She has an amazing technique called ‘the work’ that makes you examine negative sitautions, people etc. in your life and turn it around – you have to listen to believe or understand it really 🙂 Transformative.